Out trip to Corpus Christi was scrubbed due to radio failure at our Choate site. This vexing shut down took some time to diagnose, but proved to be a badly arced-over power pin on a DB-9 interconnect cable. The radio and 1074 interface board for Link 1 to San Antonio was innocent! I have replaced the cable connectors, including the pin and receptacle that failed. We will go back when we can to complete revamp of link 2 out of Choate to Link 1 at Corpus Christi north (CPR). Thanks to Bart, KG5PGH, who dropped by the site and generously hauled Dink's dual-band ground plane and the tired Sinclair 307-2 Yagis home. Our next trip scheduled for over night 14-15 November to Alpine will be to install NXU at our site along with a brand new Sierra controller and CDM radios. 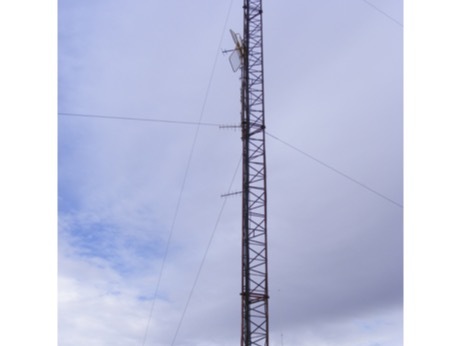 En route, we will be picking up duplexers at Ft Stockton for marriage to new CDM link radios. (Other sites will be visited, depending on time and energy available). The team will be Mary, KG5PGI, Bart KG5PGH, Marco, KB5HQL and me. 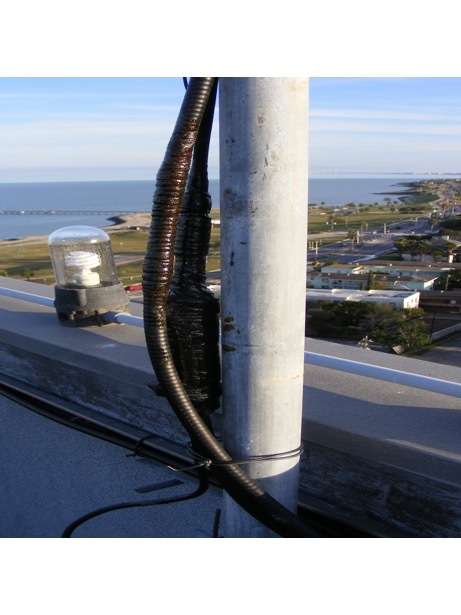 We finally got together at Spohn Shoreline in Corpus Christi yesterday to repair the 440 repeater antenna feed and activate PL northward from Choate. We found a surprise at the LDF-4 hard line joint on the DB-413 collinear. The patented goop called Vapor-Blok by Decibel Products had oozed into the connector as a sticky mess. With water leakage the corrosion was severe. SWR at duplexer in cabinet went from 3.7:1 to 1.1:1. At the antenna end SWR with dummy load was around 1.1:1 and improved to the antenna measuring 1.2 on the roof; back at the radio and duplexer coax losses "improved" the SWR to 1.01:1. On the road, coverage was full scale past Calallen. We are fairly certain a 2018 spring cleaning will be necessary. Perhaps a new connector will be required on the antenna itself. Dink lubed his weather anemometer and assessed approach to a new rain gauge. He found a non-connection on the Choate receiver - when properly connected the PL worked and we left it on. The only downer was a lack of signal from Choate. Thanks, Stan, KD5ZSY and Dink, WA5LNL for a day's hard work on the shore. Our next big trip is to Ft. Stockton. 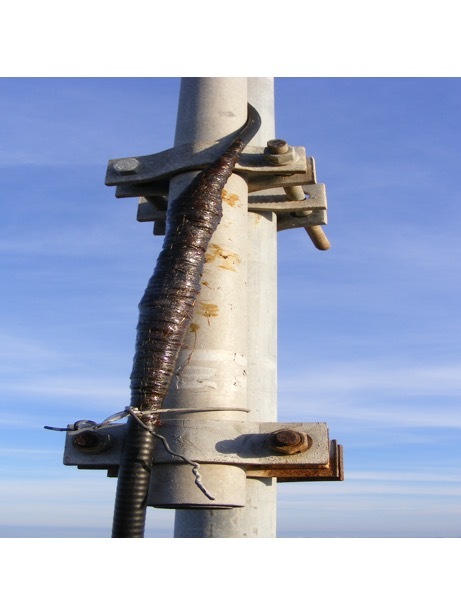 Our team visited Longfellow Mountain and got rid of an uncontrollable audio squawk coming from a link transmitter's associated receiver. A new transceiver did the trick. We re-installed Bill, KD4LXC's APRS digipeater and then drove over to the Fort Stockton site to feed the killer bees lurking in the shack walls. After a pleasant stay at the Hampton Inn, Fort Stockton, we arose to an iced-over windshield and light sleet on a 23 degree morning. After the defroster melted the ice, we returned to our radios on the mesa overlooking Fort Stockton. We rotated removal of retired units and installation of the new Motorola CDM trays. 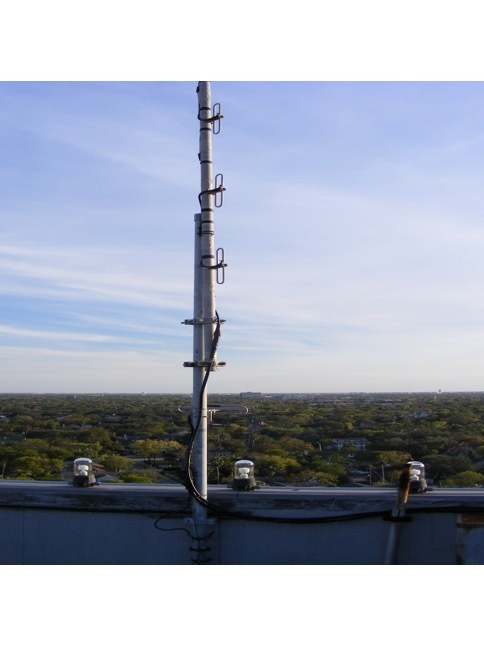 Our creaky knees sounded a chorus as we jostled the units around the existing Micor repeater and cooling fans. Lunch on the mountain was very pleasant because the temperature had climbed into the high 60's. The balmy climate awakened the bees, some of whom entered the shack through a cable penetration in the west wall. We mistakenly grabbed a can of hydrocarbon-based insect spray, which just made them mad. Viper dust eventually cleared them from the shack. We packed up to leave and started down the mesa, only to realize that the repeater had failed. We had a spare along, so changed it out. Previously the Palomar user interface boards were changed out for a couple of SARBA* replacements. On the return trip we installed the newly designed audio filter boards. The new KD5DR design includes PL filtering on every channel. After evening pizza in Fort Stockton we drove home. The new Micor at Fort Stockton heard us well beyond the winery on I-10. Now for the bad news. Dink and Dennis reported us solid at San Antonio and Hemphill but their audio showed severe chop-out in our direction. Serial dial tones elicited from Fort Stockton, Longfellow, Pandale, Brackettville and Uvalde were solid; fully quieted. San Antonio west was severely chopped up. So-called "PL-talk-off" is the likely culprit. We will need to clean up the PL-induced issue during January. All in all, this was a remarkably successful trip. The real fear was we would be unable to find the cause of the Longfellow squawk and equally concerned about bee stings. But it all worked out! Our next trip west will be to Penwell and Midessa unless Alpines ethernet drop materializes, in which case we do that gig first. Locally, Red and Mark are reporting 1-way coms south. Will look into that ASAP. Special thanks to our very hard-working crew, Bart, KG5PGH and John, WA5WPJ.